Pokemon Quest is a fun game that is finally available on Mobile along with the Nintendo Switch. If you just downloaded the game on Mobile or wants some tips, this guide will cover everything you need to know. Don’t worry, this game is not that complex. When you go into a battle, it is called an expedition. Your team of Pokemon will automatically seek out opposing enemy Pokemon attack and defeat. You can only have up to two special moves per Pokemon. Once you tap/click on a special move, there is a cool down until that move can be used again. There are also 2 more buttons on the screen during an expedition. On the left you have what looks like a play button. If you click on that, your Pokemon will automatically fight and use their special moves at will. This is best used when farming lower level expeditions that you know your team will win on their own. The other button on the right side of the screen is a flee button. Time an enemy boss’s move just right and you can doge that devastating blow! Speaking of a boss, each expedition comes in waves of 3 or 4 with a boss fight at the final wave. As far as battling goes, that is all there is to it! Once you win an expedition, you gain at least one Pokemon Quest Power stone and some ingredients (we will discuss cooking later). Power stones are crucial in order to keep advancing in the game. There are only two types of them: a mighty stone which increases your ATK stat and a sturdy stone which increases your HP stat. They also come in four tiers: basic, bronze, silver and gold. Also bronze through gold stones carry special abilities! The bronze stones have one special ability slot, the silver gems have 2 and the gold gems have a whopping 3! Needless to say, gold stones are the best gems in the game! Healing From K.O. – Increases health after the Pokemon lands a K.O. By far the most coveted special ability to get is hit healing. Your Pokemon are always constantly attacking, so that extra HP recovery each time an attack lands makes all the difference! If one of your Pokemon has a move that boost its attack, giving it a sharing stone will also boost the attack all Pokemon in your party for example. Play around with these stones to see what best suits your type of gameplay! SPOILER WARNING! If you would rather experiment with the cooking aspect of the game yourself, then don’t read any further! Personally, I never looked up a list of Pokemon Quest recipes. Playing around with the cooking is the funnest part of the game for me. With all the being said, here is the long list of recipes and what Pokemon you can expect to get out of them! As you level up in the game, you unlock better pots to cook: bronze, silver and gold. 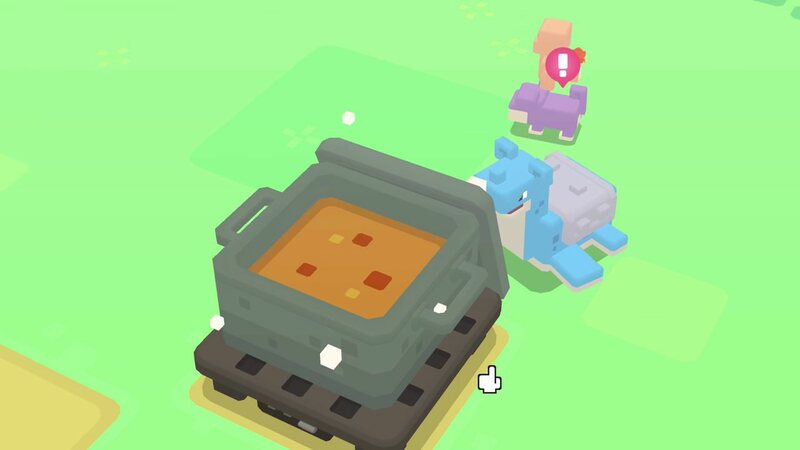 Bronze will cook up Pokemon up to a certain level (around 25), Silver will increase the Pokemon’s level that you cook even further (up to lvl 50) and Gold will have the potential to be a level 100 Pokemon! Of course all of this is at a cost. Each tier of cooking pot will cost you extra ingredients. It will also cost you another expedition to do for a silver pot and an extra 2 for the gold pot in order to cook your Pokemon. So choose wisely and play around with the cooking to best suit your needs! This is the last major part of the game, yet simple! Once at home base, hit edit your team at the bottom of your screen. That will take you to see all your Pokemon. Next hit the training button on the far right. Here is where you can either level up your Pokemon through training or change their moves! If you have a Pokemon you want to level up, then simply put it in the single slot to the left. Here is where it gets interesting. 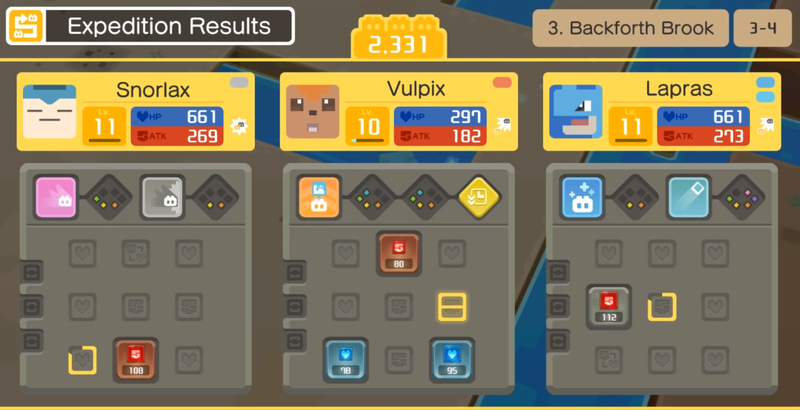 In order to maximize the most XP, you MUST use a Pokemon that has the same typing as the one you are trying to level up. If you don’t, your Pokemon will not get much of an XP increase at all. You’ll see that in the progression bar. Remember, any Pokemon you use to train to increase the level of another Pokemon, WILL NOT COME BACK! It is basically a sacrifice. So only use Pokemon of the same typing and ones you didn’t want to use anyways. Same goes for move learning. In order to have the highest possibility of learning a new move, use a Pokemon of the same typing! I personally would say 60% is a good enough chance to give it a try. You should be using a Pokemon you wouldn’t mind sacrificing anyways, so doesn’t hurt to try. If you haven’t yet, give Pokemon Quest a try! It is a lot of fun to play if you want to take a small break from Pokemon GO. I find myself playing it at night before bed. Now this game is free to play, it also gives you a free 50 PM tickets and a free Pokemon every 22 hours. BUT, if you do spend a little money on one of the expansion packs, it will enhance your overall experience (I never spent any money, but I am stuck! haha). There’s a couple other small things I left out, but you guys will find it out through normal gameplay. If any of you have played Pokemon Quest, let us know how you like it! The post Pokemon Quest Mobile: A complete guide appeared first on Pokemon GO Hub.